Windows Server has always been a bit different. It looks like your desktop computer, and includes dozens of features that you have no interest in using. Some would say that’s not a problem, since you can just bypass the features you don’t need. Yet, then there are the potential vulnerabilities in those unneeded services, or the need to reboot when a patch is issued for a service you don’t even use. Thankfully, Windows Server 8, now available in beta, will enable a core that can selectively add and remove components, much like Linux, so businesses can only run what they need. David Cross, Partner Program Manager in Windows Server group, discussed on the Windows Server Blog Tuesday how the Windows Server 8 Server Core could be used to build more efficient cloud services. Microsoft spent one year and $10 million dollars talking to cloud solution builders to learn how best to tailor its offerings for them. Since large cloud deployments can include thousands of servers, optimizing the servers to have a small footprint and dedicated functions was one clearly-defined need. Since Windows NT Advanced Server was released in 1993, Windows Server has been delivered as a "monolithic component" now known as "Windows Foundation", which included Windows Explorer, .NET framework, desktop shell, drivers, multimedia support, and Internet Explorer. You could then install server roles and optional features on top of that. 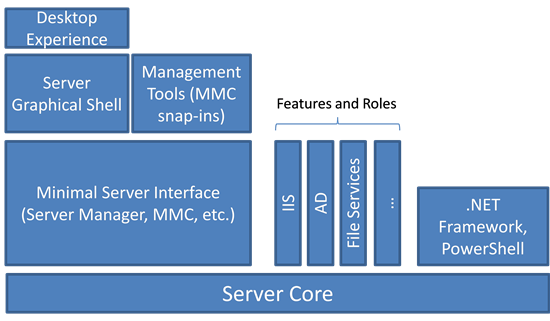 Server Core was introduced with Windows Server 2008, allowing stripped down server roles to be installed, but wasn’t widely used due to the limited number of roles it supported, the lack of popular management tools, and the inability to customize the configuration. Windows Server 8 addresses these issues, providing a core that can be expanded to provide any required services. 14 server rolls are now available, each able to be installed and removed as needed, including File and Storage Services, DNS Server, Print and Document Services, and Web Server. Beyond the available roles, even the GUI is optional, with the standard interface being a command line. The traditional Windows Explorer desktop with Internet Explorer can be optionally installed, as well as a Minimal Server Interface which provides GUI access to only core configuration options. Minimizing the footprint of each server installation will save disk space for businesses that run servers in virtual machines. Servers will have fewer security vulnerabilities since unneeded services aren’t present. Fewer reboots will be required since only updates for enabled services will be installed. Businesses can install or remove any roles without having to “start over” by reinstalling the server. Administrators with limited roles can be given access to a server with only those roles. Microsoft isn’t the first to create a minimal server that is highly configurable. In fact, it’s closer to being the last. Unix and Novell Netware were providing focused, modular systems in the 1980s and 1990s. Microsoft’s changes are probably most driven by Linux, which has offered a minimalistic yet highly configurable server platform since the early 1990s, and has become the dominant web server operating system. With many computing services moving to the cloud, Microsoft needs to improve its web server offering to compete against Linux. Based on the changes it includes, we think most businesses that are using Windows Server will want to give Windows Server 8 a try.